Busy? Always busy? Are you working on the right things right now? Then rate these things in terms of urgency. Which ones need to be dealt with no and which ones can wait. 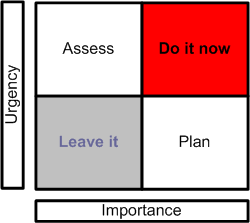 Place them on ths Grid and now thing again about what work you need to do today, this week, this month. If this mode of thinking is new to you try this as a weekly activity, until it becomes second nature. You could also do worse things than buy his book.